Editor's note: This story was written by two professional journalists. Please do not consider it for student award competitions. 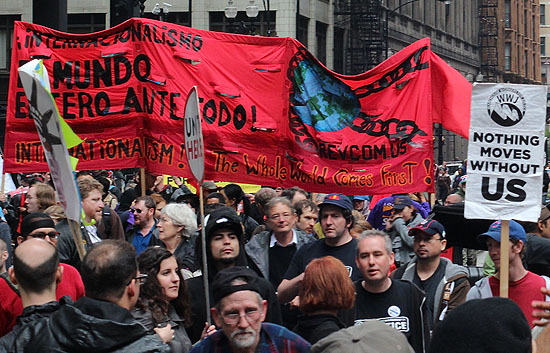 While the city of Chicago becomes the focus of global politics during the NATO summit on May 20-21, much of the attention for locals is placed in foreseen protests, closures and other related activities. Recently, Mayor Rahm Emanuel established the Office of New Americans with the goal of “making Chicago the most immigrant-friendly city in the world,” said Adolfo Hernandez, a Latino community activist who heads the office. But despite the mayor’s recently announced efforts, many immigrants in the city continue to lag behind other groups in education, jobs, language, health care, neighborhood safety, workplace rights and lack of legal status. In preparation for the upcoming NATO and G8 summits, advocates for reform, such as Tamara Jacoby of ImmigrationWorks USA, argue that the United States needs to be more open to reforming immigration laws in order to improve the economy. She explained that discussing these issues and comparing laws with other countries at the summits is important to the United States. Jacqueline Ortiz and Maria Luisa Téllez are parents of the Telpochcalli Community Education Project, a non-profit whose mission is to work for social justice for Little Village residents through education. They say they are well aware of the challenges faced by immigrants in the city of Chicago. While Ortiz and Tellez’s children attend school, these two mothers receive training on immigration issues in hopes to keep other immigrant parents informed about the latest on local or federal policy that could make a dramatic impact in their lives. "Participating in the Community Education Project Telpochcalli, here within the organization, is how we know about everything that is happening," said Ortiz. 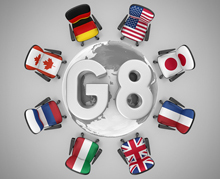 They also argue that in order to alleviate many of the harsh realities faced by immigrants today, immigration reform needs to be presented during G8 summit. There are about half a million undocumented immigrants currently in the state of Illinois, however there is no official number for the city of Chicago. The Illinois Coalition for Immigrant and Refugee Rights policy director, Fred Tsao, roughly estimates the number to be that 1 in every 10 Chicagoan is undocumented. “There is no good number for the city of Chicago but it could be kind of a rough estimate, could be a quarter million,” said Tsao. Over the past 12 years, community organizers and advocates like Tsao have been pushing for immigration reform for undocumented people, but every year the efforts have been futile. While the passage of any iteration of immigration reform remains stagnant, the threat of deportation is a formidable reality in the lives of many undocumented immigrants. Groups like ICIRR have been focusing on passing local legislation that will make the lives of immigrants easier. Recently, ICIRR was among the pro-immigrant groups who advocated against Secure Communities in Chicago, a program by the Department of Homeland Security (DHS) designed to identify immigrants in the U.S by sharing finger print information in collaboration with the Federal Bureau of Investigation (FBI) and local enforcement agencies. According to pro-immigrant groups, the system had the potential to target undocumented individuals with minor traffic violations and other minor offenses. Recently, Cook County opposed secure communities with the passage of the Cook County immigration detainers ordinance prohibiting the sheriff's office from cooperating with detention requests from federal immigration officials, unless the federal government covered the cost of holding an immigrant longer than local law allows. The widespread lack of health insurance is a predominant cause preventing immigrants from gaining access to quality care. Currently, undocumented immigrants do not qualify for any form of governmental health care coverage. While programs like Medicaid, provide medical financial help to eligible individuals, proposed Medicaid cuts have threatened the access to quality and affordable health care for eligible low-income immigrants in the city. The All Kids program, a program funded by Medicaid, has provided health care access to undocumented children for seven years, however, according to Tsao, that program, along with other vital programs to low-income, immigrant communities, are slated to disappear with the proposed $2.7 billion cuts on Medicaid. In addition, the new Affordable Care Act does not clearly offer any form of coverage for those who are undocumented. Furthermore, in the city, Emanuel’s announcement in November of the closure of six mental health clinics on the North Side and South Side, has threatened the access to these vital services to the Latino immigrant community in Chicago. Clinics, such as the one recently closed in the Back of the Yards neighborhood, often assists many low-income immigrant families ineligible to access health care insurance and who otherwise cannot access private services. One type of discrimination that often goes unreported is housing discrimination. Although the federal Fair Housing Act exists to prevent such infractions, an estimate by the National Fair Housing Alliance reports that four million violations of the law continue to occur each year, however less than 30,000 are actually reported. In Illinois, according to an analysis of the Latino Policy Forum of HUD data, 61 percent of discrimination complaints involve discrimination towards Latinos. Immigrant children face educational challenges related to language and cultural barriers throughout different stages of their development. Some of the biggest challenges in regards to early childhood education in particular for Latino children are access and quality issues, said Isabel Anandon, policy analyst at Latino Policy Forum. In terms of access, Anandon explained the Latino Policy Forum has found “a huge disconnect between the available slots for early childhood education for Latinos specifically,” Anandon said. According to the Latino Policy Forum, the state of Illinois recently passed legislation mandating children’s access to preschool programs in their native language, which signifies a great improvement in the quality of learning as many immigrant children will be building a solid academic foundation. Aside from early childhood education, immigrant youth face new challenges. Although numbers of undocumented youth living in the city are hard to attain, Chicago is home to a diverse community of undocumented youth who graduate from high school and do not qualify for federal grants or government support to move on to college and later work as professionals. However, the passing of the Illinois Dream Act last year made it possible for the creation of a DREAM Fund Commission which will help provide scholarships, college savings and prepaid tuition programs to undocumented students in Illinois. Much work has yet to be done in order to raise the private funds and train school staff and administration to disseminate the proper information to students and parents. But even with the passing of the Illinois Dream Act, undocumented college graduates will not be eligible to work. Immigrant workers in the city not only face the challenge of low-wage employment but also face challenges posed by programs like E-Verify— a federal Internet-based system that verifies the employment authorization of new hires. Ortiz explained that the E-Verify program prevents immigrant employees from finding stable and quality employment. Furthermore, the use of E-Verify can make employers more inclined to move their hiring operations off the books, resulting in violations against minimum wage, health and safety, and other worker protections, according to a report by the Migration Policy Institute. In a particularly violent weekend in March, 49 people were shot and 10 died in the city, according to Chicago Police Department statistics. One of the victims was 6-year-old Aliyah Shell, a child who was shot and killed playing outside her home in Little Village. While gang activity is often tied to the spikes of violence, anti-violence proponents like Marina Alonso, president of the community organization Mothers for Peace, said she believes that lack of communication between police and neighborhood residents also has much to do with the continued violence. Alonso explained that neighborhoods with a high immigration population, often do not report crimes or call the police because of fear. “People live in fear and that fear prevents them from developing a relationship with local police particularly after former threats by the Secure Communities program,” she said. Lack of police-resident relationships, according to Alonso, allows gang activity to continue as residents will be less likely to identify individuals involved in a crime. 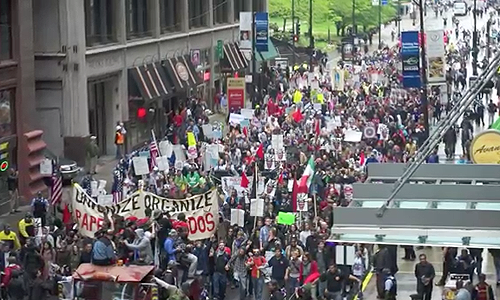 While some groups prepare statements, town halls and demonstrations to oppose or question the NATO and G8 summits, immigrants will continue to dwell in the barriers to access a quality of life rooted in the lack of a legal status. A successful policy, according to Hernandez, will entice immigrants to be more engaged and to contribute event more to their local communities. Editor's note: The Red Line Project partnered with The Gate Newspaper to produce this story on immigration.